OCCASIONALLY WE WILL HIGHLIGHT A STORY SUBMITTED BY A SURVIVOR. IF YOU'D LIKE TO SUBMIT YOUR STORY LET US KNOW USING THE "CONTACT US" LINK AT THE TOP OF THE PAGE. Janet, an ovarian cancer survivor and patient advocate, discusses how she became involved in a maintenance treatment clinical trial. 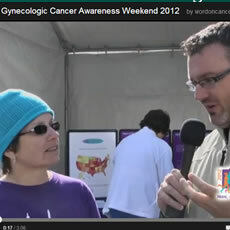 This interview took place at the Run/Walk to Break the Silence on Ovarian Cancer-Dallas/Fort Worth. My journey begins in 2008. I had a recurrence of my ovarian cancer and had tried four different treatments, none of which were effective. So I asked a survivor in my support group to go with me on a second opinion visit to a major cancer center located several hundred miles away. I had the hopes of participating in a clinical trial. After driving five hours, we settled into our hotel room and discussed our strategy which included a list of specific questions to ask this physician. The next morning we met with the physician and learned there were no clinical trials specifically for women with my type of ovarian cancer – clear cell. My friend had brought several clinical trial articles describing different treatment options and we showed the doctor a paper describing the clinical trial results of a different drug combination. The physician felt this regime could be a good option for me so upon returning home, I immediately started this treatment. Remarkably my CA125 dropped as did the size of my tumors. Every time we were with a group of ovarian cancer survivors, I'd say to my friend "You saved my life!" Then, one day she turned to me and said "I didn't save your life – those 70 women on that clinical trial saved your life!" I was taken aback at first, but knew she was right! If those women had not participated in that clinical trial, this treatment would not have been available. Since there is not a cure for recurrent ovarian cancer, I knew that this regime would not keep my disease in check forever. But for over a year and half my disease was stable. I have now moved on to another treatment, also available to me because of clinical trial results. I am glad there are now two clinical trials just for women with clear cell ovarian cancer. These experiences have brought to my attention how all women with ovarian cancer have benefited by the less than 5% of ovarian cancer survivors that have participated in clinical trials. To those brave women, I thank you so very much. YOU saved my life!